‘Leaf‘ – used to describe the combination of the petiole and blade(s). Blade – usually broad and flat. This blade the main ‘engine’ of the plant, where most of the chlorophyll in a plant is. They can also be described as the lungs of plant since this is where the exchange of the carbon dioxide and oxygen occur on a plant. Simple leaves have one blade. 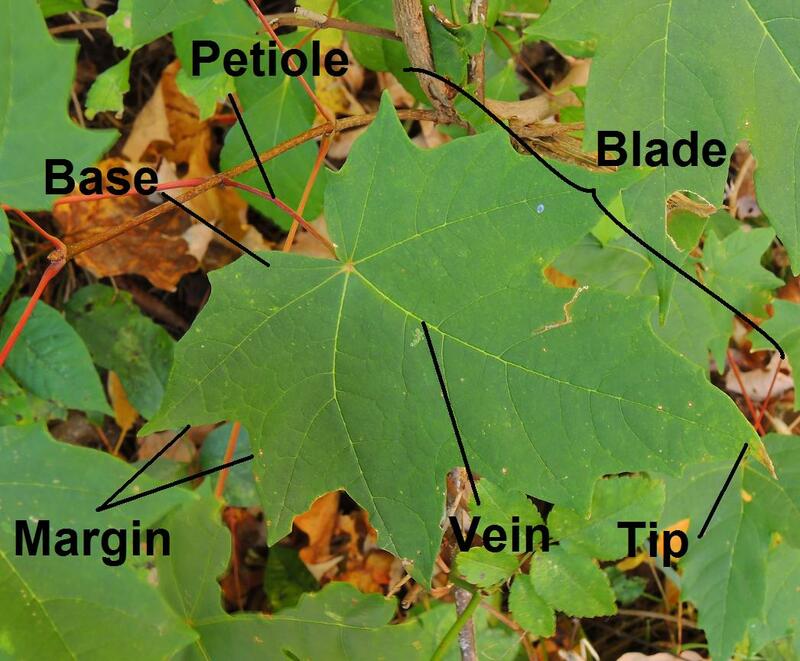 In compound leaves there are multiple blades attached to one petiole, with each blade refered to as a leaflet. Petiole – many times described as the ‘stem’ of the leaf. Not to be confused with the actual stem of the plant, the petiole is not a woody structure and will fall with the rest of the leaf at the beginning of the plant’s dormant season. If you think you are looking at a compound leaf and are unsure of where the petiole is an easy way to find where the petiole of the leaf is to backtrack from the leaf blade until you reach a bud. The piece before you hit the bud is the petiole. On compound leaves the petiole-like structure between the individual leaflets is a rachis. Vein – visually appears to us like the ribs of the leaf with the central vein often called the midrib. If you can’t distinguish where the veins are turn the leaf over as they are often more pronounced on the backside of the leaf. Internally the vein is a bundle of vascular tissue that acts as a tunnel for water, sugars, and nutrients to move in and out of the leaf. Margin – the outer edge of the leaf blade. Different margins include entire (smooth), serrated and toothed (like a saw blade), doubley serrated (little teeth on top of the big teeth), undulated (wavy), and lobed (thick finger-like projections). Tip – the tip of the leaf. Base – the base of the leaf. This entry was posted in Getting Started, Identification, Leaf, Morphology and tagged Base, Compound Leaf, Doubly Serrated, Entire, Leaf, Leaf Blade, Leaflet, Lobed, Margin, Midrib, Petiole (botany), Rachis, Serrate, Simple Leaf, Tip, Undulated, Vein on October 22, 2013 by Sue. ‘Flower‘ – the plant part from the sepals out; containing the sepals, petals, stamen, and pistil. Flowers are either complete or incomplete. Complete flowers have all four parts (the sepals, petals, stamen, and pistil). Incomplete flowers will be missing one or more of the parts. Sepal – usually green colored, they offer a covering for the petals before the flower opens. May or may not be present. Calyx is the term used for the group of sepals around the flower. Petal – the showy and usually colorful part of the flower. May or may not be present. Corolla is the term used for the group of petals around a flower. 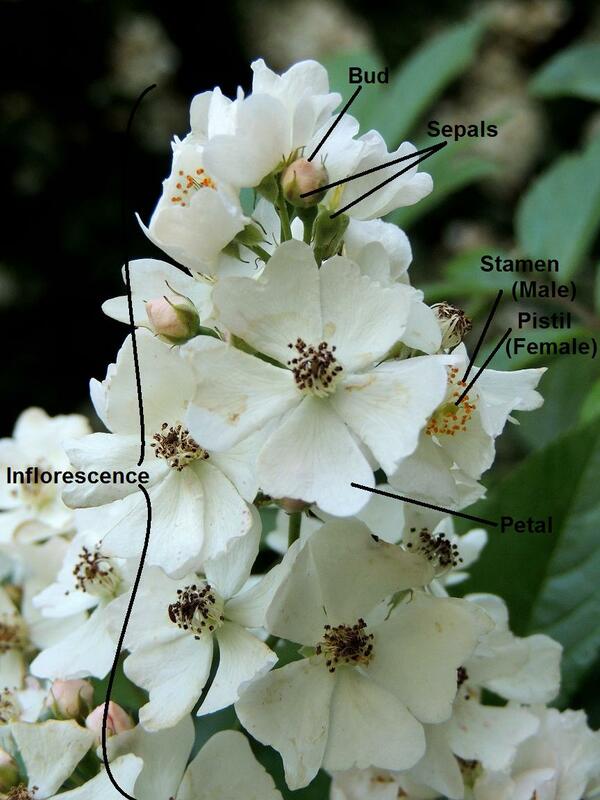 *if the sepals and petals are similarly colored and not readily distinguished from one another they are collectively refered to as tepals. Stamen – the male part of the flower, where the pollen comes from. May or may not be present. Pistil – the female part of the flower (along with the ovary), Where the pollen enters to fertilize the flower. May or may not be present. Inflorescence – a loosely held collection or grouping of flowers on a stem. Each individual flower is called a floret. Bud – the immature flower. This entry was posted in Flower, Getting Started, Identification, Morphology and tagged Calyx, Corolla, Floret, Flower, Inflorescence, Petal, Pistil, Rosa multiflora, Sepal, Stamen, Tepal on June 24, 2013 by Sue. These are the most important characteristics to know if you are using any of the basic field guides for to identify woody trees and shrubs. Terminal Bud(s) – placed at the tip of the twig were the branch will continue its growth the following year. Called apical dominance, the plant will put more energy into these bud(s) to allow them to grow farther, faster, and bigger than any of the lateral buds and continue the vertical and horizontal spread of the plant. Lateral Bud(s) – buds that grow along the side of the twig. These buds develop between the base of the leaf and the stem and will create a new branch when they start to grow. Leaf Scar – where a leaf was once attached. If you are looking at a one year-old twig the leaf scar will always be below a bud. Lenticel – one of the many types of breathing pores on a plant. May not be on all species, will look and feel like many repeating bumps on the otherwise smooth bark. Bud Scale – overlapping pieces that protect the bud from the elements. A bud can have many scales to just one or even none (those being called naked buds). Like leaves and leaf scars, once the bud starts to grow the scales will fall off, leaving scar tissue showing where they once where. 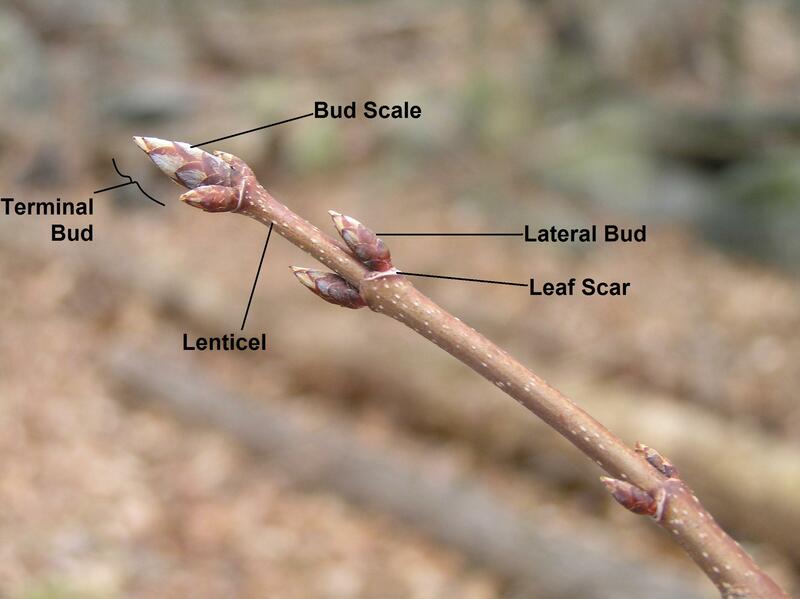 Bud Scale Scar (not pictured) – a ring of scar tissue around a twig or branch. Represents the site of last year’s terminal bud, marking where last year’s growth started from. This entry was posted in Identification, Morphology, Stem and Trunk, Winter on April 15, 2013 by Sue. Enter your email address to follow us. We don't like spam as much as you don't like spam. We will never share your email address with anyone.